Since I turned 1, I can now magically eat strawberries and nuts and drink cow's milk and have given all 3 a try. Mom thought my love of watermelon would match my love for strawberries and I'd gobble them up, but I'm give or take. I'm easing into the milk thing and so far it's going pretty well. Now on to bigger news. Tuesday dad had to work late so mom and I hit up Chipotle for dinner. Uh if you haven't tried it already, Chipotle guacamole is to die for! And to top it all off I got this mini bag of chips just my size. So fun! ...and then went home and played with my mini bag of chips again. On Thursday, Aug 4, school was closed (sweet) so Mimi and I hung out the whole day. She even took me down the street to the pool for some fun in the sun. Since school was out again on Friday (sweet sweet), Mom took me on a trip to the mall to meet up with Grandma and Gramps for some Nordstrom Cafe lunch. I ate a TON. Then they helped me go down the escalator. Why don't they have these everywhere? After that we took an obligatory trip to Gap Kids where I (aka Gpa BobBob) talked mom into buying me this sweet ball. Just what I needed to polish off my collection! Then of course I had to go for a ride on the carousel!!! As you can tell by my expression, it was good, not great. On Saturday we hit up the bank to get my birth certificate and then headed to the post office so I could apply for a...wait for it...wait for it...passport! Mom and dad are hoping to take me to Thailand at the end of the year. Well mom is, but not so much dad. Something about me and 20 hours on a plane scare the bajeebers out of him more than snakes on a plane. Puh-lease. 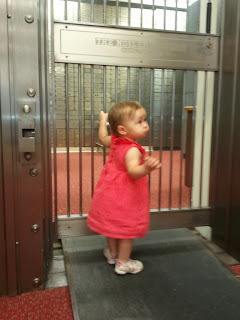 By the way, dad wanted to lock me in with the safe deposit boxes, but I didn't think that was very funny. That night, BobBob and Ta came to visit so they could go to a play with mom and dad, but before they left I reveled them with my mastery of picture books. PS - Why don't all chairs come in my size?